Asuka Tsuchimiya is the driving force behind her school's Radio Research Club, which investigates paranormal phenomenon such as a rumor that you can travel to a different world by tuning a radio to a certain frequency at a certain place and time and chanting. To the shock of Asuka and her club mates, this actually works and they find themselves in a twilight world, where a girl who looks suspiciously identical to Asuka uses special weaponry to save them from rampaging bunny-like creatures. The other girl actually is Asuka from a parallel world, and she's on a mission to destroy Clutters, which are disastrously trying to turn various parallel worlds into twilight on behalf of the King of Twilight – a fate that already befell the other Asuka's home world. This leads the Radio Research Club on a series of dimension-hopping journeys where they try to help defeat the Clutters and meet alternate versions of themselves in the process. This anime-original series from Fall 2018 was part of a mixed media project celebrating Animax 's 20th anniversary, but it wasn't popular enough to merit weekly streaming reviews when it debuted. That's disappointing, as the way this series plays out could have made for some interesting week-to-week discussion. At the same time, its true merits only become clear when evaluated as a whole. While it definitely throws out some interesting points and social commentary as it progresses, only near the end does the importance of its earlier content become apparent. The series follows the basic structure of the standard cross-dimensional caper, where characters from the “base” world are able to travel to other worlds and meet versions of themselves and their acquaintances that differ from them in curious ways. They get to learn new truths about themselves as they see how their doppelgangers respond to differing circumstances and analyze the flaws in different world structures that represent exaggerated social, political, or economic issues from an outsider's perspective. There's also an extradimensional threat that will eventually reach the base world, along with the the perspectives of the doppelgangers on our heroines' way of life. In execution, this is mostly as formulaic as it sounds. The only major deviation is the addition of magical girl-like elements as several of the girls gradually learn how to manifest their “twilight selves.” (These forms don't look anything like what you would expect from magical girls and the transformation scenes are almost instantaneous, but there are too many resemblances to the concept to call them anything else.) The core cast is all female, but that doesn't change things much from expectations; it just means that many standard anime girl archetypes are present in the core group, from the Genki Girl to the Glasses Girl, the Shy Beauty to the Ridiculously-Long Twin Tailed Girl, and so forth. For all of the fairly standard plot construction, the series generally manages to keep things interesting with its romps through other worlds. The otherworldly Asuka, who eventually gets nicknamed “Seriouska” because of her vastly differing demeanor, makes a good foil for her base-world self, while Glasses Girl finds her own foil in a more free-spirited version who eventually becomes a regular cast member. Alternate-world versions of other characters also make for some entertaining interactions, such as one case where two of the girls are wanted criminals. The mechanism for the cross-world transfers also causes some interesting complications; each time they travel, one girl acts as the “anchor,” which means that she pops into the head of her parallel-world identity instead of being physically transported there like the other girls. Sometimes this has significant consequences, not the least of which is that the anchor-girl cannot meet herself. The effectiveness of the parallel world designs vary. One is a mostly-standard world where one girl is slated to be married to an actor she has crushed on, while another is a Wild West-theme setting where justice is dispensed via shootouts. Easily the most impactful example involves an alternate world where the populace lives on islands and can order anything they want to be quickly shipped via drones. The story is none-too-subtle in its take on how the dangers of overreliance on an Amazon -like company can lead to dastardly ends. There's also a theme about getting too obsessed with one's smartphone, whether to play games, post selfies to chase “likes,” or any variety of other possible over-uses. Whether heavy-handed in their treatment of the subject matter or not, all of these scenarios push the featured girls to expand their mindset, with the result usually being the enabling of their “twilight self” manifestation. That plays an important role in the story's final resolution, both for the abilities that the girl can use and for how they grow as people. The most distinctive visual feature of the series is its penchant for heavy use of CG animation in its action scenes; the “twilight selves” are every bit as much pure CG as the mecha . The quality of this effort leans more toward the visual fidelity of higher-end mecha series than the typical CG-animated idol performance sequence, allowing for some very active action scenes. 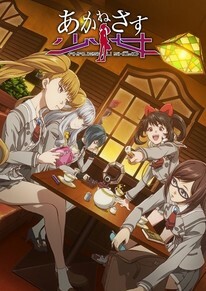 The artistic effort is otherwise solid, with well-defined (if also anime-typical) character designs, distinct variations from world to world, a mostly warm and grounded color scheme, and solid backgrounds regardless of the setting; later episodes have occasional periods where the quality drops off, but this isn't a pervasive problem. Action scenes are generally not graphic, while fanservice is present only in small doses. The musical score for the series, which leans heavily on electronic sounds, manages adequately well in both lighter and more intense moments. The only place it truly distinguishes itself is in opener “Soranetarium,” which features a slow, heavy electronic bass beat backing a soulful song synced perfectly to its visuals. It is easily one of the better anime themes of 2018, well worth a look even if you don't watch the rest of the series. Closer “Broken Radio” is a more mellow song whose visuals impress far less. but it still makes a solid wrap to each episode. The Japanese voice work is most remarkable for how Tomoyo Kurosawa varies her delivery enough to be convincingly different and yet still the same person in each version of Asuka, though Lynn as Yu also has her moments. While the story ends with a major crisis seemingly having been averted, it doesn't feel like the major mysteries of the story – such as what happened to make Asuka's younger brother missing in every world – have been solved, nor is it clear how safe the base world may be. Despite that, the season's late episodes bring together the balance of serious and goofy story elements well enough for the story to be effective as a tale of personal growth.